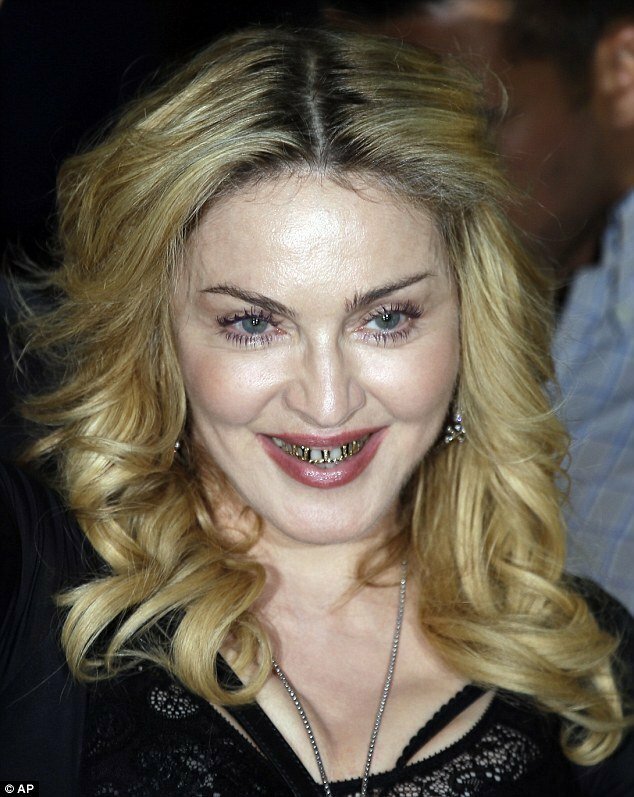 Madonna was keen to give fans and photographers a closer look at her gold grills as she paid a visit to the Hard Candy fitness studio in Rome on Wednesday. While the unusual fashion accessory is a common feature in the mouths of younger stars like Justin Bieber and Rihanna, Madonna – who celebrated her 55th birthday last week – clearly puts no limit on what she can get away with. Wearing a black mini-dress, black tights and those fingerless leather gloves she’s so fond of sporting, Madonna called in to the Colosseo gym for what amounted to a quick inspection, but all eyes were inspecting her mouth as she made her across the threshold. The singer and actress let her hair down in France recently at the Menton music festival before celebrating son Rocco’s 13th birthday with a game of paintball that included young boyfriend Brahmin Zaibat and her teenage daughter, Lourdes. Her own birthday fell on August 16, and Madonna celebrated by throwing a fancy dress party themed around the French Revolution.